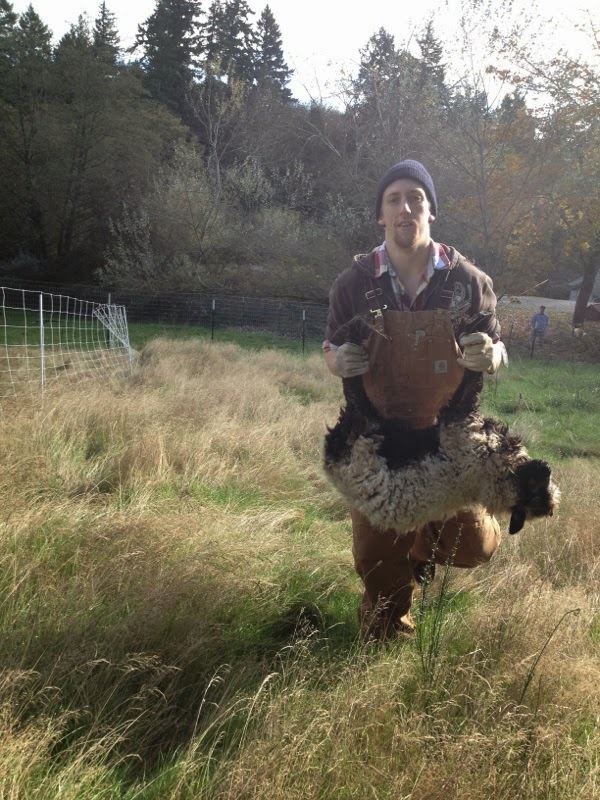 PNB corps de ballet dancer Ezra Thomson on his family’s farm near Gig Harbor, Washington. After five years, corps de ballet dancer EzraThomson says he feels right at home here in the Pacific Northwest. And, apparently, so does the rest of the Thomson family. Originally from San Bernadino, California, Ezra moved to Seattle as a Professional Division student in Pacific Northwest Ballet School in 2009 and joined the corps de ballet the following year. His sister moved here two years later and their parents joined them just last year, moving to a small farm in Gig Harbor. Ezra, wearing a grey hoodie and jeans, was headed out to Gig Harbor for the weekend when I caught up with him last Friday afternoon. 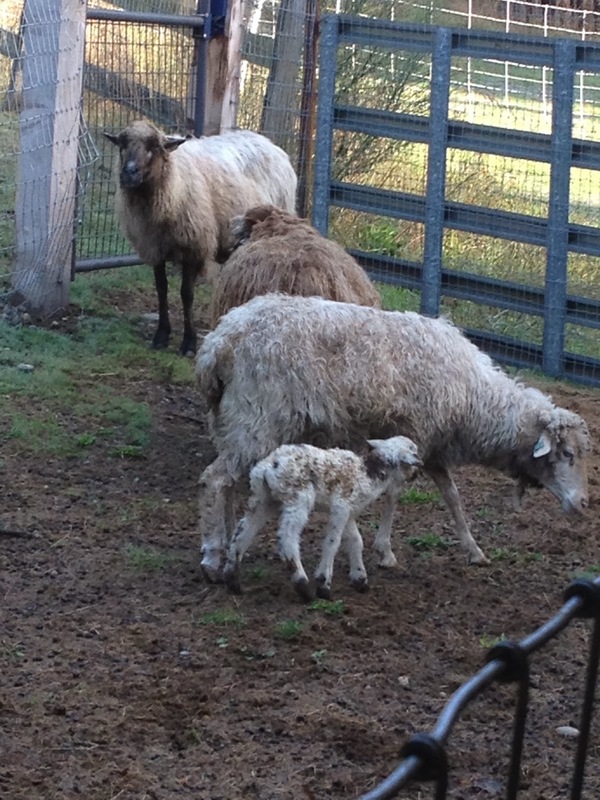 —dogs, chickens, turkeys, and sheep! We start off with the basics…just talking about the weather. Seattle’s been a signature shade of grey with an extra dose of fog all week. I ask if he misses the sunshine of southern California, “No, I like it here. I like wearing coats. I don’t like shorts.” he says dryly, smiling. We quickly move on to more important topics, like how to cook Rainbow Trout. 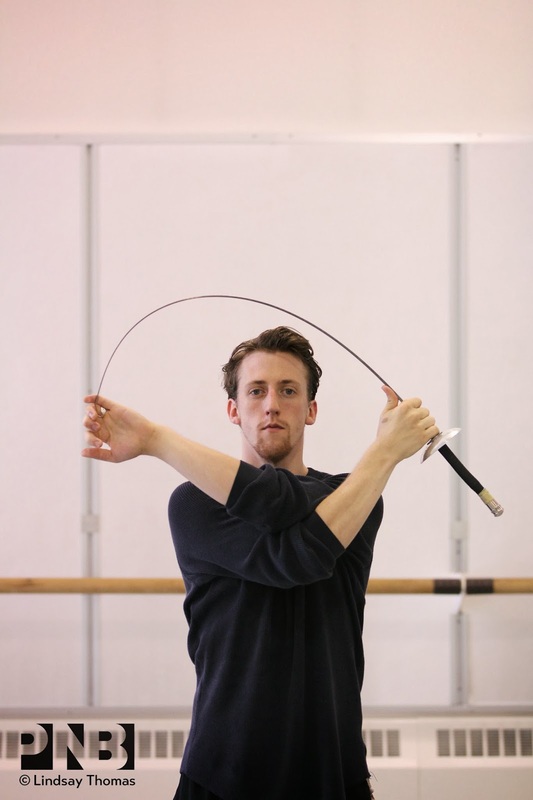 Ezra rehearses with a fencing foil, a prop for the men in Jiri Kylian’s Petite Mort. Ezra gets animated talking about his latest favorite dish saying, “Lately, I’ve been cooking Rainbow Trout in a salt crust. I stuff it with lemon and rosemary and bake it whole in the oven. Then, when it comes out, I put it in the middle of the table and crack the crust with a butter knife. It’s delicious!” It’s also a pretty dramatic way to eat dinner, I think, and realize that for Ezra, life onstage and off is about combining excellence and fun. 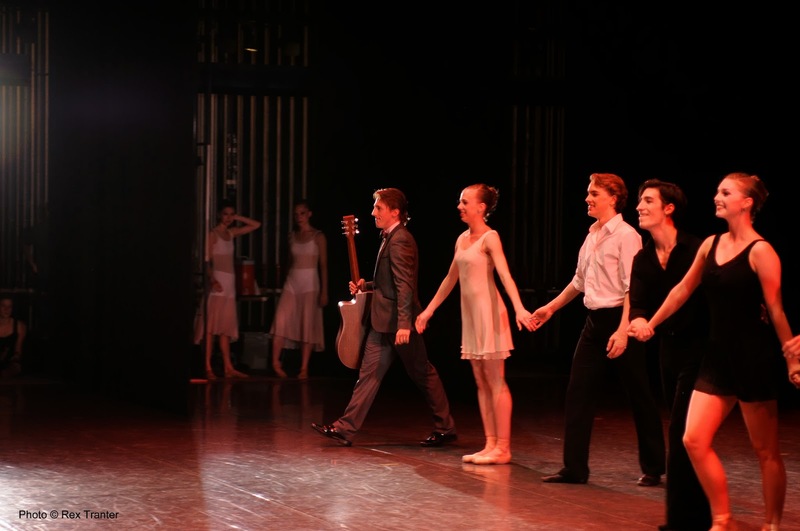 Ezra played a hilarious apple-spearing Megastar in the PNB premiere of Jiri Kylian’s Sechs Tanze (Six Dances) in 2010. Onstage, Ezra excels in dramatic and comedic roles. Recently, he’s been rehearsing several roles in Sechs Tanze (Six Dances) as well as a role in Kylian’s more serious and sensual Petite Mort. Like the rest of the Company (and PNB audiences) he’s anxious for casting to be announced (ten days before opening night) so that he can find out which roles he’ll be performing. 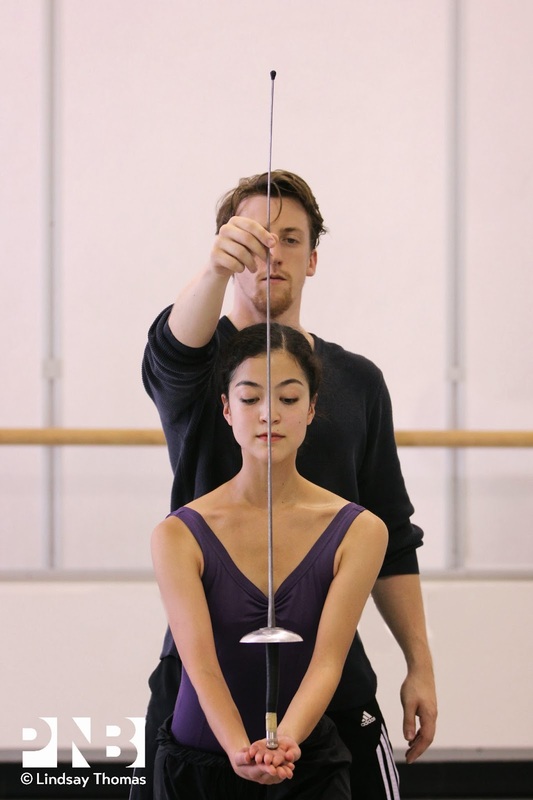 Ezra rehearses Petite Mort with fellow corps de ballet dancer Liora Neuville. Ezra’s transparent when it comes to his appreciation for Kylian’s work saying, “He’s excellent, especially musically. He’s so versatile while holding on to a core of movement…his pieces are all so different, but you can still tell it’s his. 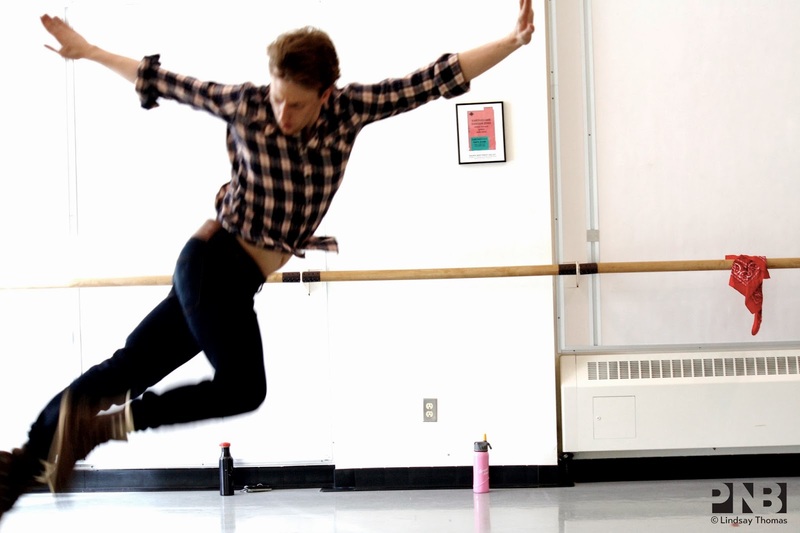 His style is so deep and grounded.” Naturally, at least for Ezra, the conversation moves from Jiri Kylian to blues music as we start discussing his latest project, a new piece for next June’s NEXT STEP choreographic showcase. Ezra choreographing for NEXT STEP in PNB’s studios. 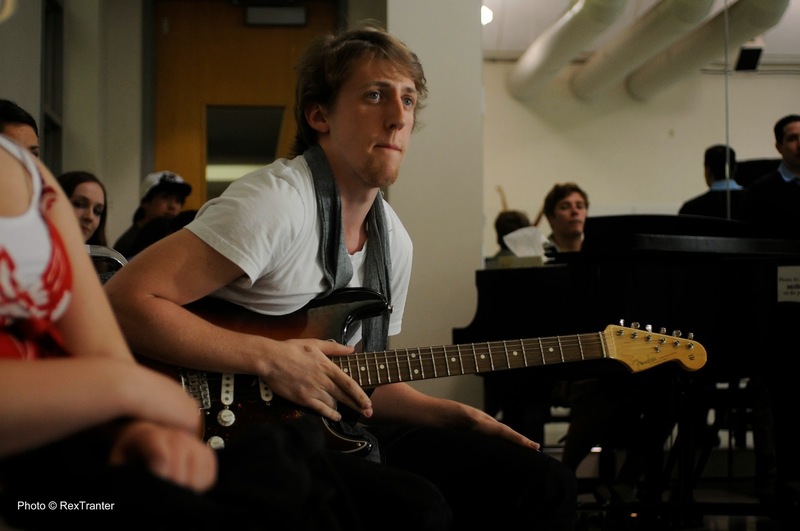 Ezra accompanied the dancers in his 2011 NEXT STEP work on guitar during an open rehearsal (above) and in performance (below). Blog by Judith May Austin. I love the generosity and intelligence that Ezra gives to every performance. Even in the corps pieces, I enjoy watching him because he is always engaged. My favorite male corps dancer. He always emotes so well on stage.